Your patience is exemplary. After a long and storied journey, RiME is finally available on PC, Xbox One, and PlayStation 4. We’d like to thank each and every one of you for your continued passion throughout development, and the kind words you’ve sent our way after release. You’ve been an energizing force through some tough times, and no amount of thanks we could give would be enough. Thank you. First, I’d like to introduce myself. My name is Cody Bradley and I’m the Lead Producer on RiME for team Grey Box. If you played Grey Goo, you’re probably familiar with these letters. If not, no worries. I’ll give a brief preamble. We like to do these letters from the Producer to provide additional transparency into what’s going on with our development teams. Tim does an excellent job trying to bridge the gap between our fans and the team, but sometimes it’s better to get the message from the source. With that said, we’re receiving a handful of reports from players experiencing performance problems on the PC. While these reports are not universal or even a majority, we do want to make certain we address them quickly. Two of our core values at Grey Box are quality and community, and we would be remiss to ignore the pleas of even one person who was unable to play our game. During development, we go through several cycles of compatibility testing on the game. This basically means that we’re moving from PC to PC swapping out hardware and evaluating how it performs. While we try to be as thorough as possible, it’s incredibly difficult for us to cover every permutation of motherboard, graphics card, RAM, processor, and hard drive out there. That means the next few days are critical to addressing the performance concerns. If you’re having trouble, we need you to please report to our customer service team at http://support.greybox.com and provide them with as much information as possible. Over the next few days they’ll be analyzing all of the reports and looking for patterns between hardware and the settings being used. From there, we can inform our development team where to start looking for issues. With that said, we’ve already had some luck with diagnosing a few problems. AMD RX five eighty cards appear to be having trouble in general, and our team is looking into what the cause might be. Additionally, the NVidia ten eighty cards are having problems with SSAA anti-aliasing. Switching to another option may help. We’ve also had users report that switching the VSync setting to Double Buffering significantly boosted performance, especially on nine hundred series NVidia cards. We know this can be frustrating (we share in that frustration), but we’re confident that with your assistance we can resolve these issues in the next few weeks. On the subject of Denuvo, we understand that this is a very sensitive topic for gamers. Know that we did not make the decision to include it lightly. The fact of the matter is that we looked at the piracy rate on games that were very similar to RiME, and it scared us. At the end of the day, our obligation as a publisher is to protect our development team’s intellectual property to the best of our ability. Right now, Denuvo is our only effective option. The only thing that Denuvo is currently doing for us is checking to make certain that Steam’s (or Origin’s) DRM is still attached to the game. There is a small performance hit associated with this, but at this time we do not believe it is causing the problems that are currently being reported. We might be wrong. We’re monitoring the situation. It has always been our intention to remove Denuvo in the event of a crack. Based on other titles, we expect the protection to last two weeks, maybe three at most. We have no intentions of patching a new version of Denuvo in at that time. That’s more or less the skinny on things for the time being. We’ll be continuing to monitor things as the situation evolves. If you have questions, please feel free to reach out via the medium of your choice. We’re busy right now, but we’re going to try our best to get to everyone. Thank you for your patience and for all of the feedback so far. May 31, 2017, 4:25 a.m. It's really great to see the producers so involved with keeping the community up to date! I am wondering if you might be able to tell us when the release date for RiME on Nintendo Switch might be in Australia. I am very excited for this game and was shocked when the Switch was the only system that wasn't included in the release date. May 31, 2017, 4:43 p.m. Thanks for the positive reinforcement. It's much appreciated! As far as the Switch is concerned, the best I can give you right now is roughly the same time as North America. We're trying to be ready by the end of your Winter. We have one more benchmark to hit, and then we should be able to zero in on a specific date. Thanks for your continued patience and for reaching out! We'll be in touch again soon. June 2, 2017, 10:21 a.m. It was a toss up for me between the PS4 and Switch haha. 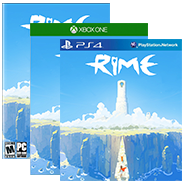 The Switch won over only because it's the newer console and I work away a lot and love platformer puzzle games so being able to take RiME with me will be great! Can't wait for it. Hope everything goes smoothly for you! Is there a release date for RiME on the Switch yet? ?